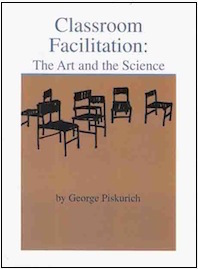 In Classroom Facilitation: The Art and the Science, George Piskurich discusses what a true classroom facilitator does, and provides you with some ideas on how to do these tasks well. It is not facilitative itself, but rather it is instructional as most books are. When you understand this difference, that is the difference between presenting information as is done in a book, or in a lecture, and the facilitation of learning, you will have made a giant step toward becoming a more effective classroom facilitator.